Nelson Mandela Metropolitan University has been selected to host the three-day opening leg of the inaugural Varsity Netball series, which starts in Port Elizabeth on September 21. The action-packed series, which draws its inspiration from the popular Varsity Cup rugby, will see eight tertiary institutions competing in a fast-paced, made-for-television format. NMMU journalism student Dumisane Chauke will captain the SPAR-Madibaz side as they take on the University of Johannesburg, University of Cape Town and Stellenbosch University in the initial round-robin competition. Chauke, who was named goal shooter of the tournament at the South African senior championships last month, will lead a strong attack alongside former Protea centre Mampho Tsotetsi. The home team will also present a solid defence, spearheaded by masters student and goalkeeper Zanele Vimbela. Vimbela was part of the national squad that took silver in the World University Netball Championships in Cape Town last year. 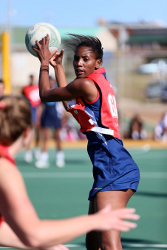 According to SPAR-Madibaz netball manager Theresa le Roux, spectators could look forward to high quality netball, as the universities’ senior national players would be available for most of the six-week series. She said the home team expected strong competition from the likes of UJ and Maties on the opening weekend. Le Roux said one of the highlights would be the introduction of the two-minute power play. Aside from some exciting netball, she said audiences could also look forward to a festive atmosphere, with lots of crowd participation and sponsored giveaways during the breaks. Le Roux said the action would take place at the Missionvale campus on the Saturday and Sunday, with matches starting at 2pm and 3.30pm. The teams then move to the university’s South Campus for the live TV broadcast on the Monday night, where UJ will take on Maties in the first game at 6pm and NMMU will face off against UCT at 7.30pm. The University of Pretoria hosts Tshwane University of Technology, North-West University and the University of the Free State over the same weekend. Le Roux said her institution would also host two televised play-offs on September 30 and October 14. Varsity Netball, which is a Varsity Sports initiative, follows the successful introduction of the concept in other sporting codes like football, athletics, hockey, volleyball and rugby sevens. Tickets are free of charge and available at the venue or from Le Roux on 041 504 3145 or [email protected]. Gates open one hour before the start. IMAGE CAPTION: Captain Dumisane Chauke will lead the SPAR-Madibaz squad in the opening leg of the inaugural Varsity Netball series at Nelson Mandela Metropolitan University in Port Elizabeth from September 21 to 23.